Now you can watch videos from strangers around the world. Facebook's Live Video feature just got global thanks to an interactive map that's rolling out on the site. If you're looking for a stream from a random stranger you can either choose one from one of the highly ranked clips on the left side of the page, or click on one of the blue dots from everyone else on the digital globe. 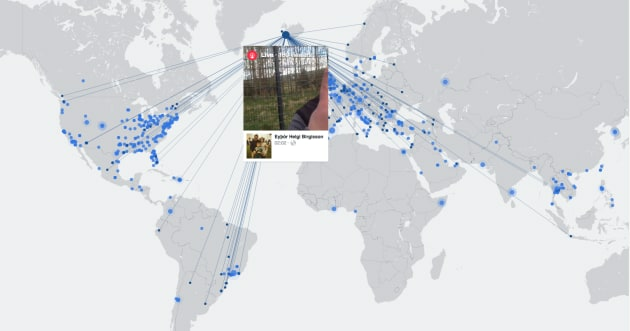 To access the interactive map, a new "Live Video" app is available on the left navigation bar in your Facebook timeline. In addition to showing where a stream is originating, when you click on a video, it also shows where it's being viewed. The interactive map should help fans of live videos find new broadcasters. Before today, the only way to know if an account is live streaming is by following that person or brand and waiting for a notification. Facebook has been pushing Live Video aggressively lately. At its F8 developer conference it announced an open API so developers could add the feature to their cameras.